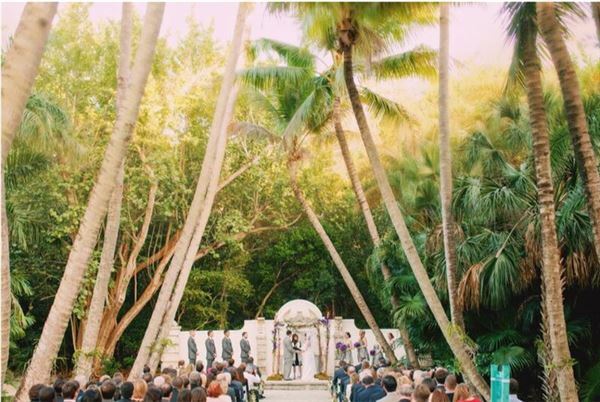 Spanning 35 acres, Bonnet House offers a variety of exquisite settings for events of any size, each uniquely beautiful in its own way. Whether you are planning a close and intimate gathering or a grand and lavish affair, Bonnet House sets the scene for a perfect event. Bonnet House is an outdoor, garden setting available for rentals. Guests have the exclusive use of the tree lined alee/dry fountain, veranda lawn, hibiscus garden and inner courtyard. See the attached menu to get a feel for our approved caterers offerings! Nestle in a 35 acre oceanfront tropical island setting; Bonnet House is a spectacular place to have an outdoor wedding. There is a gorgeous courtyard with a stone walkway, palm trees, tropical flowers, a water fountain and a beautiful arch way for magnificent photos that will bring romantic memories for years. Paintings around the building tell the rich history of Bonnet House. There is a magnificent display of tropical orchids throughout the gardens because of Mrs. Bonnet's passion with orchids. She also loved animals that live on the 35 acres of lush gardens. There are swans, monkeys, peacocks, turtles and many more to add to the beauty of the lavish gardens. The gardens consist of 5 unique ecosystems for your memorable wedding pictures. After the ceremony you and your guests can take a stroll throughout the gardens and stop and take beautiful breathtaking pictures. When you are done admiring all the beauty the gardens have to offer, everyone can sit down and enjoy a scrumptious mouthwatering meal. There are several companies that can help plan your romantic affair. They have years of experience and have planned many weddings at this unique and special wedding venue. You can get the numbers from the website for your hassle free event. You can plan a small romantic wedding or a huge extravagant event. Each wedding is unique and special for you and your love ones to cherish for a life time. This venue can handle it all. So, impress your family and friends with a lavish affair among the gardens of Bonnet House. Fairy tale dreams do come true at Bonnet House Museum and Gardens.